Post Updated: Now includes all 10 tips, still feel free to subscribe to the newsletter though! Here in the UK we’ve been sweltering in the heat over the past week. As a nation, the Brits love two things: Talking about the weather and complaining about the weather, and I think we’ve had just cause to do both this week! The issue most of us in the UK have is that there is no consistency in our climate. Two weeks ago I went out for an evening where I’d be outside all night and I put a thermal vest on, tee-shirt, jumper and coat. Fast forward two weeks and the temperature is over 36°C (97°F) and parts of the country have been hotter than parts of the Sahara! Watch Your Water Consumption: Make sure you stay hydrated. The heat will make you burn through your bodily water reserves quicker and this can slow your brain down. make sure you have a bottle of water with you and top it up regularly. It’s also especially important to carry some water with you if you’re using public transport – breakdowns always seem more common in the hotter weather! Watch How Long You Work: The heat can really take it out of you mentally and physically. Make sure you get up and away from your desk for 5 minutes (at least) every hour – your productivity will thank you for it! Watch What You Eat: When it’s hot we have a tendency to skip meals. This further affect your productivity so make sure you eat something – a light salad will help cool you down an it’s healthy too! Watch When You Do Stuff: Try to get your most important tasks done before lunch time to benefit from the cooler air. After lunch, when the air is warmer we’ll feel less like doing anything so try and accomplish easier tasks like sorting emails and paperwork during this time. Watch Your Meetings: Even on the coldest winter day a meeting room can become as hot and stifling as a tropical rainforest. 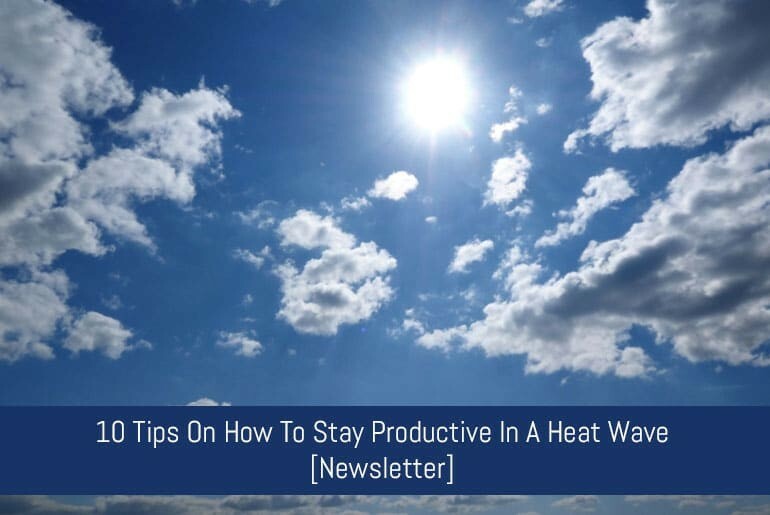 You really don’t need that when the mercury’s rising so try to avoid scheduling meetings. If you do have to have a meeting, try to do it over the phone so attendees can sit at their own desks (hopefully by a fan) or have it as early in the morning as possible. Watch The Windows: Although it may be nice to have a 360 degree view of the city, that’s also 360 degrees of available space for sunlight to come in and superheat the office. Make sure you have blinds installed and consider moving desks away from windows if they’re in direct sunlight. Watch Your Zzz’s: With night-time temperatures being as high as our usual day time ones it can be difficult to sleep. Make sure you air your room out before you go to bed and if you can, put a fan on to circulate the air. Keeping it on while you’re trying to sleep may make it difficult for you to drift off because of the noise. If you use a duvet make sure you swap to a lighter tog weight) or swap to a sheet. Watch Your Alcohol Intake: This goes along with point 2 above. It’s really tempting to go the the pub beer garden after work but alcohol can cause you to loose more water if you’re not careful. Watch What You’re Working On: Make sure you’re only working on one thing at a time. Multitasking actually causes you to be less productive, instead look at “Back Filling” your tasks. Heat saps your concentration so concentrating on a single task will help you get it finished quicker and with less mistakes.